The drama surrounding the privatization of the world’s first kibbutz is an ironic allegory to current global crises as the world financial bubble bursts together with our strong belief in the capitalist dream. At the center of this drama is a bitter dispute over the privatization of the world’s first kibbutz, 'Degania', established 100 years ago on the banks of the Jordan River. 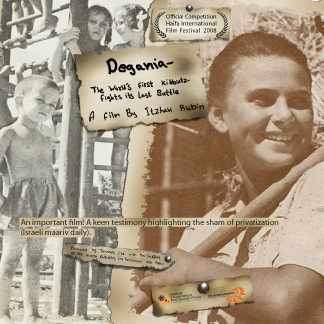 Degania was the utopian flagship of a Zionist-socialist experiment copied by 400 other kibbutzim. Its ethos was "from each member according to his ability, to each member according to his need". Einstein, Kafka, Gandhi and Masaryk came to see and learn fromDegania. It reflected a struggle between the ideals of cooperative life with shared responsibilities versus a community of individuals each responsible for his own destiny. Now the social fabric, woven over a period of 100 years, is being torn to pieces as the ideological rift widens. This is a local as well as a universal story of the struggle between values of social responsibility as opposed to economic and individual freedom.